CHARLOTTE, N.C.--(BUSINESS WIRE)--The Flexible Packaging Association (FPA) announced the winners of its 63rd Annual Flexible Packaging Achievement Awards and the Molson Coors 12-Pack Cooler received the Highest Achievement Award. Integrated with the EASY-LOCK by APLIX® closure system, the Grab & Chill pouch was designed by Bemis Co. Inc. as a reusable cooler bag for Molson Coors. This innovative pouch also received Gold in the category of Expanding the Use of Flexible Packaging, Gold in Printing & Shelf Impact, and Silver in Packaging Excellence. 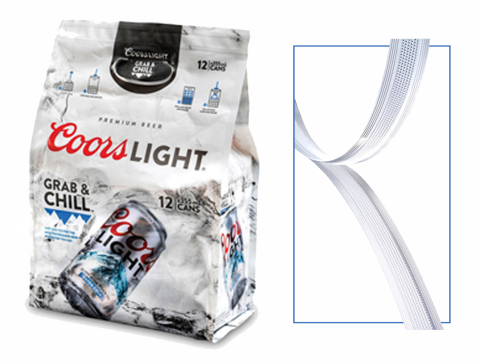 Unlike traditional paperboard cartons, the Molson Coors Cooler bag is reusable, easy to use and can go straight from the shelf into coolers. The Grab & Chill bag offers many packaging conveniences, including the sensory and audible EASY-LOCK by APLIX® closure system that allows consumers to fill the bag with ice and instantly reseal to keep beverages cold. EASY-LOCK by APLIX® is an innovative reclosable system designed for flexible packaging. Designed with simplicity and functionality in mind, the hook-to-hook technology makes it easy to open, with minimal pressure needed to reclose packages. Additionally, its sensory features assures consumers their package is sealed. The EASY-LOCK by APLIX® is a 100% polyethylene recyclable closure (accredited by Trex), which addresses the consumer, retailer, and consumer product companies’ demands for more environmentally friendly packaging.